This is starting to get out of hand, maybe it already is out of hand, but the way the Cubs are losing games is almost hard to believe, even for the Cubs. The latest chapter in this horrific story of a season took place tonight in Cincinnati where the Cubs seemingly did everything to win. They received a tremendous performance from starter Travis Wood, jumped out to an early lead, had a strong performance from the bullpen for the most part, and yet still lost. Such is life as a Cubs fan and Cubs team at this point, every game this year has been decided by four runs or less, think about that, all of them. You know what decides close games in the majors? Bullpen and clutch hitting, usually with runners in scoring position, two things the Cubs have been terrible at. Luis Valbuena hit a monster two-run shot in the top of the thirteenth to give the Cubs a two run lead, nothing could go wrong, until it did. Before anyone could even savor that two-run homer, Michael Bowden, who didn’t get much help from Sappelt in right field, gave up three runs and the game was over, ho-hum, another mind numbing loss. At The Plate – David DeJesus got things going right away in this one as he led the game off with a home run, he finished the day 2-for-5 with a home run, two walks, an RBI, a stolen base, and a run scored. Nate Schierholtz was solid as well going 3-for-6, but also had three strikeouts. Luis Valbuena had the big hit for the Cubs, that two-run homer that I mentioned, and finished the day 2-for-6 with two RBI’s, and a run scored. 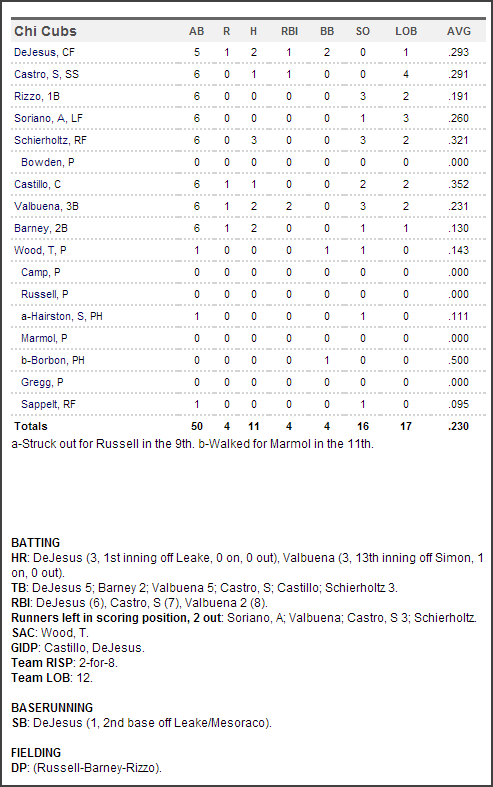 Darwin Barney was 2-for-6 with a run scored, the Cubs left 12 men on base in this one, that didn’t help either. 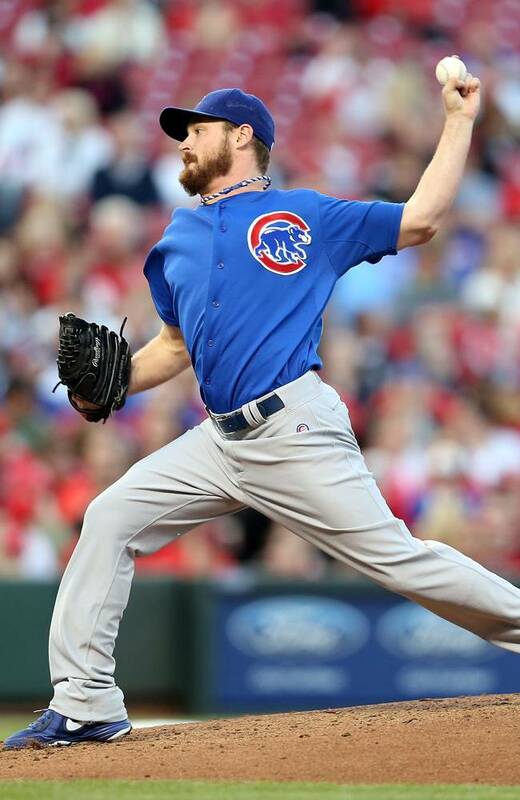 On The Mound – Travis Wood was great again, against a tough lineup, and once again had nothing to show for it. He went 6.1 innings giving up two runs on four hits while walking two and striking out five. Shawn Camp worked a third of an inning, but balked in the tying run, yes, again. James Russell, Carlos Marmol, and Kevin Gregg all had scoreless appearances out of the pen. Marmol was particularly strong going two scoreless innings while walking two and striking out two. Michael Bowden was good, then really bad, he took the loss going 1.2 innings giving up three runs on four hits. Up Next – Carlos Villanueva looks to play stopper tomorrow night against Tony Cingrani, the Reds highly touted prospect. First pitch scheduled for 6:10 PM CST.